Cheap Thrills defies that conventional wisdom. The movie was done fast – shot in a mere 14 days. It was done cheap – a budget of roughly $100,000. And it was done well – an alternately comic and disturbing look at the desperation wrought by the last decade’s financial meltdown on a shrinking, suffocating middle class and the chasm between the haves and have-nots in a post-Occupy Wall Street America. The directorial debut of E.L. Katz, Cheap Thrills unfolds mostly in a single night as a pair of old high school buddies (Ethan Embry and Pat Healy) resort to increasingly extreme acts of debasement to amuse a wealthy couple (David Koechner and Sarah Paxton) with money to burn and time to kill. The film’s co-cinematographer Andrew Wheeler talked to Deep Fried Movies about the making of Cheap Thrills, his affection for The Natural and his long road to cinematography by way of punk rock. 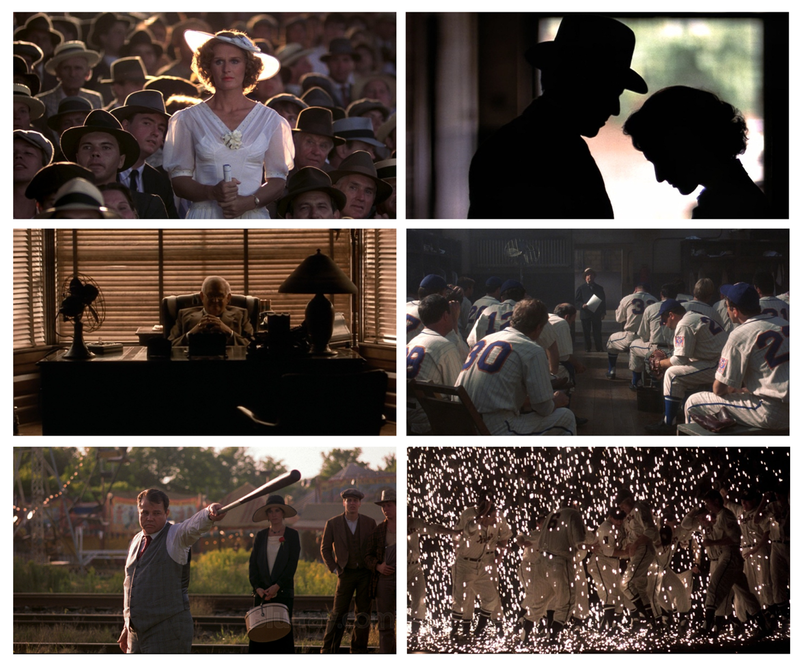 (Above) Images from director Barry Levinson’s 1984 film The Natural, shot by legendary cinematographer Caleb Deschanel. In a profile featuring you on the International Cinematographers Guild website, you talk about your love of Barry Levinson’s The Natural. Though it’s shot by one of the great DPs in Caleb Deschanel, it’s not a movie you often hear referenced in terms of influences. What about The Natural made such an impact on you? I always loved that movie growing up. That movie made me want to become a baseball player as a kid and later on, when I started to get more into moviemaking and cinematography, I realized how influential and powerful image-making can be to make a kid want to be a baseball player just through seeing a movie. I always had a gut, emotional reaction to it and a big part of that is the cinematography. I have a box that my father made for me – it’s kind of like a skinnier version of a cigar box – and it folds open and on the top part of the box is a gray card and on the bottom half of the box is a chip chart. 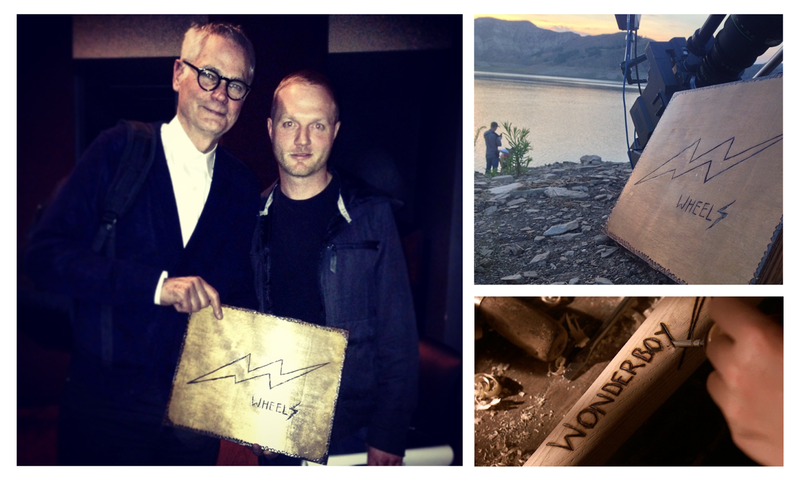 My dad made me this wooden box and he wood-burned “Wheels” onto the outside of the box and he burned a lightning bolt too (like the lighting bolt on Roy Hobbs’ bat in The Natural). People actually call me “Wheels.” I went to school at the American Film Institute and one of the great things about going there is that even after you graduate they have these seminars that are only for students or grads where DPs come in and show a movie that they worked on. And they had Caleb Deschanel come in and screen The Natural less than a year ago. I went up there and I got him to sign an original poster print of The Natural from the 80s and I showed him the box as well. I’m not really one for that kind of idolization, but he was taken aback by the box and it was pretty cool! (Below) Left: Caleb Deschanel and Andrew Wheeler at the aforementioned AFI screening of The Natural. Right (top): Wheeler’s engraved box. Right (bottom): The engraved bat from the Deschanel-lensed The Natural. Were you one of those kids who was making movies from an early age? When I was 5 years old my family won an early home video recording (device) in a raffle. It was basically a big box that was essentially a VCR with a tethered cable to the camera. So you had to carry the (entire) box around to record. I quickly became pretty fascinated with it, which is not an uncommon story for a lot of filmmakers. One of the first things me and my brothers did – and we were like 5, 3 and 2-years-old at the time – was we tried to do these stop-motion animations with Star Wars figures. So the fascination was there very early on. I played baseball growing up and we’d play wiffle ball in our backyard every summer and we’d record our stats and we’d also, with this camera, record some of our games. I’ve re-watched some of those tapes and there’s one where we had my dad come out and help film us and I’m maybe seven years old and I’m telling him, ‘Don’t put the camera there. That’s not the right place for the camera.’ I was just drawn to it right away. Even though you showed this early inclination toward cameras, you took a very circuitous route to becoming a cinematographer. That included a detour playing guitar for the punk band R.A.M.B.O. It was a very long route, actually. It was not meant to be that long. I went to college at the University of the Arts in Philadelphia and I went to be in the film program. At the time I wasn’t interested in a mainstream kind of filmmaking at all and that school was (focused) on docs, personal narratives and experimental films. So I did that for the next four years in college. I remember getting all my 16mm film back – black and white reversal shot on a Bolex – and it was always like Christmas when the film came back. But it was not a technical school at all. I didn’t even know what C-stands were. At that point I had started playing music and as soon as I got out of school I went on tour with the band. Aside from shooting docs of us on tour, filmmaking was kind of over for me for a little bit, not on purpose but I was distracted for a while playing music. When I got back from the tour I eventually went on to the first film set I was ever on and I went to work as a grip/electric. I didn’t know what anything on the set was. I didn’t know any of the gear, but I took to lighting really quickly and I started working as an electrician and a grip in Philadelphia when I was between tours with the band. And after doing that a couple times I started realizing what a cinematographer was and it didn’t take long to realize that’s what I wanted to do. How did your time playing music influence your work as a cinematographer? That part of my life helped me learn a lot about people. I played in 50 countries or so, all over the world, and I realized that emotions are the same everywhere. Cultures are different and people react differently to things, but happy is happy, sad is sad, and angry is angry everywhere. It seems simple, but that’s what you’re trying to put on the screen. Cinematography can sometimes lack soul if there isn’t a backbone of life experience to base your choices on. I certainly got a huge dose of that and it gave me a wider perspective. Also, being with five or six people for weeks on end teaches you to get what you need without making people too angry and you have to do that as a cinematographer sometimes. Cheap Thrills is credited to two cinematographers – Sebastian Wintero and yourself. What was the breakdown of duties on the shoot? Sebastian was the original DP of the film and I believe Cheap Thrills’ schedule got pushed two or three weeks . He was supposed to shoot a big commercial in Europe and (the new shoot dates) went into his other obligations and he could not shoot the second half of the movie. I got involved a few days before principal photography started and then I came in on Sebastian’s last two or three days to do B camera as he transitioned out. I tried to honor Sebastian’s intentions, but it helped that we basically shot the movie in order because it helped smooth out any differences in our individual approaches. How did having such a short shooting schedule affect the look of the film? When you have a movie that is full of dialogue with four people in it at all times, just getting the dialogue on camera is a struggle. So the lighting scenarios had to be really practical. It was mostly (practical) bulbs and lamps in the house. We had Kino tubes taped into the ceiling at certain points, but that was the extent of the lighting. It was a very practical approach. It was the only way to get that movie done. Cheap Thrills is set largely at night within one house. Did you shoot mostly nights or did you do splits and just black out the windows? It was mostly splits. I think we’d start at like 10 or 11am every day and the windows would be blacked out and then when we really needed to see out the windows or do our actual night (exteriors) we’d do them at the very end of our (shoot) day. It was the dead of summer. It was like 500 degrees when we were shooting that movie, too. It was one of the hottest two weeks in Los Angeles in a long time. There was no air conditioning in the house. We didn’t even have generators on this shoot. We were using house power and then we had a blackout and we couldn’t shoot for a few hours because all the power went out. It was brutal. It was basically like a steam room for two weeks. It was the kind of movie that I’m glad I did it, but I was happy when it was over. It was a very good learning experience. It made me ask a whole new set of questions when I’m considering new feature projects. Cheap Thrills was shot on Alexas with Zeiss Super Speeds. Did you have any say in those choices since you came onto the movie later in the game? I didn’t have any say in the camera or lens choice, but that’s what the producers wanted. They had deals on it. But it was definitely the right camera for the job. The two choices at that point were an Epic or an Alexa. I actually own an Epic and I like the Epic as well, but it’s not as good of a low-light camera. It would’ve been problematic to shoot Cheap Thrills on an Epic. Most of the DPs I’ve talked to who have shot Alexa have opted to capture in ProRes rather than ArriRaw just to limit the time and cost of dealing with the larger Raw files. How did you handle that on Cheap Thrills? We did ProRes as well. We shot (Cheap Thrills) in September of 2012. I don’t know at that point how many movies were even shooting (Raw), probably only the bigger films. It’s a little easier now, but the amount of data management that has to happen (with Raw) is exponential. We actually lost footage shooting the movie. I don’t even really know what happened. It was (the shot) where a hot iron (is placed) on Pat Healy’s hand. We did the most perfect take of that and it was one of those moments that happen once a movie where you’re there filming it and everybody – the actors included – believes the moment. We watched it on playback and everybody was like, ‘Wow, this is great!’ It was a defining moment in Pat Healy’s life as an actor. He went home and wrote a profound article about it. Then we came back the next day and I was told the footage was gone. Nobody knew what happened. It was gone. It didn’t exist. Of all the moments for that to happen, and it happened. It was pretty horrible and it was so disappointing for Pat. It was crazy to have this golden moment and then have it gone. Andrew walks us through a few shots from Cheap Thrills. THE SHOT: The stakes in Cheap Thrills are about to be raised in this low-angle shot in the kitchen involving a butcher knife and an expendable finger. This lighting set-up here was Sebastian’s idea. It was just a two-foot, four-bank Kino Flo up in the ceiling. As far as changing the color temperature (to a warmer hue for this scene), this is kind of the room where things go really bad. It’s a way to say, ‘Pay attention to this part, because this is where things change.’ It’s a note for the audience that hopefully isn’t too obvious. Again, it was a practical decision. It was about the only place we could get the light in the kitchen. As far as the angle, we had two cameras going here and we covered this scene pretty well. For me, this is also where the angles start to get a little steeper, a little less traditional. You make a lot of these choices on set instinctively and it’s definitely a power-position frame, too. Clearly David Koechner’s character (in the center of the frame) is the one dictating what’s happening. THE SHOTS: Matching close-ups for a Sergio Leone-esque stare down between Embry and Healy. I very much remember making this decision. There was a little bit of a discussion between me and (the director) Evan and I said, ‘I think we should short-side at least one of them,’ which ended up being Ethan. This moment right here is the most revealing moment about these two characters to each other. Because we usually shot two cameras all the time and you’re trying to stay out of (the other camera’s) way, it’s hard to get on direct eyelines. Here we went single camera and this is just another dramatic footnote for the audience to know that some information is about to come out that’s important. This is one of the most human moments of the movie for me and I just wanted their eyelines as close to camera as possible. That’s where you can catch a glimpse into people’s souls. THE SHOT: A low-angle frame of Healy with the ceiling above him tinted pink by a projector shuffling throw still photos.